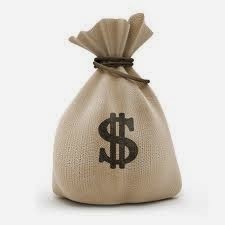 The Fact of The Matter: 2011 Property Tax Relief? The state’s property tax cap will soon have an effect here in Westfield. In July of last year, Governor Christie scored a political victory that could give voters here in Westfield greater power over how town government and the school district raise and spend money. The annual increase that a town is able to raise property taxes dropped from 4% to 2%. The Governor also included a provision that requires town government and school officials to get permission from local voters when they seek to raise taxes higher to come up with the needed cash to pay the bills. 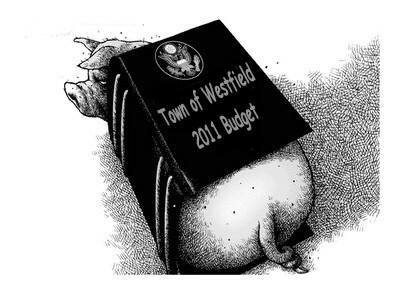 Is this the beginning of real property tax relief in Westfield? Perhaps not, if the voters flock to the polls and vote yes to anything town government and school officials say they need above and beyond the 2% cap. With State spending up 40 percent over the last 10 years, which rose faster than the rate of inflation, spending by local governments has increased by almost 70 percent during the same time period. Local governments rely heavily on property taxes, the one tax local voters routinely identify as their biggest concern. Local governments spend more money than the state does. The combined budget of New Jersey’s local governments totals approximately $45 billion while the state has an annual budget of about $30 billion. Not surprisingly, New Jersey has the highest property taxes in the nation. Over the last decade, property taxes have increased over 60% from an average of $4429 statewide to an average of $7281. Tax bills were rising at a rate of more than 7% annually by 2005, before Governor Corizine enacted a 4% cap in 2007. In 2008 and 2009 statewide increases in property taxes averaged 3.7 and 3.3 percent. Unfortunately some communities have eliminated valued services and jobs to get under the caps. The Governor’s property tax cap includes several exemptions that local governments will use to get around the limit. For example, in 2008 more than 30 percent of local governments were able to raise taxes over 10 percent due to exemptions in the cap. The deal Christie has struck with Democratic leaders would also allow exceptions, for debt payments, rising health benefit and pension costs and if an unforeseen state of emergency occurs. School districts would also get an exception to deal with rising enrollment. 2011 will be no different. With the property tax cap lowered even more, to 2%, municipal governments will be using the “exemptions” to get around the 2% cap. 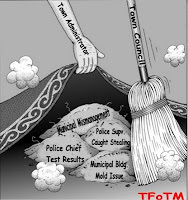 The question is, when town officials are looking to cut costs, will they be looking in the right places? If the current state of affairs in Westfield continues, the Three Blind Mice might as well be in charge. 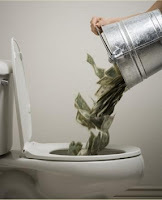 Cutting costs is necessary, but when you cut costs in one area to allow the cost of another service to unnecessarily continue, you defeat the purpose of cutting costs in the first place. Example: Police Officer Nicole (Tango) Stivale, hired 1/17/05 is currently assigned to a “desk job” inside of police headquarters. After she became pregnant, she was assigned “light duty”…..a desk job. When it was safe for her to return to her previously assigned patrol duties, she did not. It was around this time that Captain Dave Wayman had asked the town administration for a secretary. No Captain before had ever had a secretary; he would be denied, but not for long. 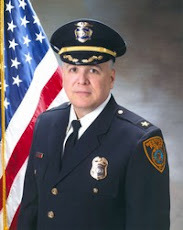 The result, Officer Nicole (Tango) Stivale (2009 salary $75,686 + health benefits worth in excess of $25,000) would eventually become the highest paid secretary in the police department. What a waste of taxpayer money. It’s money that paid for the training of a police officer while she attended the Union County Police Academy. A continued waste of taxpayer money as she continues to shuffle papers inside headquarters instead of patrolling our streets doing what she was trained to do. Example: Detective Sergeant John Rowe, hired 1/31/82. He will soon to be a 29 yr. veteran of the Westfield Police Department. He’s a throwback to the Bernard Tracy regime. Trained as a narcotics detective for a good part of his career. He is a sergeant capable of supervising the detective bureau when there was a need for a supervisor. Instead, another supervisor was promoted into the detective bureau. Where is Det. Sgt. Rowe now? He is currently assigned to the parking bureau. What is there to “investigate” or “detect” in the parking bureau? Another waste of Westfield tax dollars. His 2009 salary was $113,876. Combine that with a health benefits package of over $25,000. In 2011, close to $140,000 for a position once held by a person earning between $50,000 and $80,000. Mismanagement. Example: Police Officer Vincent Piano, hired 5/26/85. 2009 salary $97,272 + health benefits worth in excess of $25,000. Currently assigned to a desk job inside police headquarters due to an undisclosed departmental reason. Example: The construction of a new office within the police department for Captain Dave Wayman; not once, twice. The labor and materials along with the manpower needed to construct these offices, well over $30,000 when one already existed. A waste of tax $$$$. Don't even get us started on the amount of overtime Capt. Wayman billed. These and other examples exist and have been brought to the attention of Mayor Skibitsky and town officials. The response…….the finance committee continuously reviews budget expenses and the needs of each department. You know what Mayor, if I can buy “America’s Choice” Bacon at $2.99 a pound instead of Oscar Meyer at $5.00 a pound during this fiscal crisis that has hit every Westfielder in the wallet, so can you. 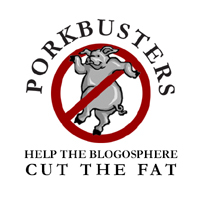 Start trimming the fat and cut the “pork” barrel spending. A little background on Nicole Stivale. Her farher got her the job after Barney Tracy "negotiated a job withg the Linden Board of Education Superintendent Joe Martino. The father runs with the Linden crowd. 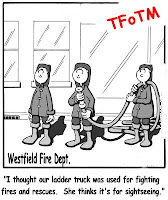 Shortly after she got hired, her cousin John Tango got hired in Westfield. Its no coincidence that Joe Martino, the son of Linden Superintendent J. Martino, was also hired as a Westfield Police Officer. 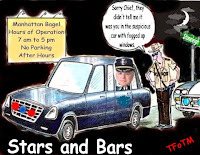 Nicole quickly became loyal to the Tracy regime and continues to be loyal to Capt Wayman allowing her to remain at her desk job playing computer games and having postings deleted off NJ.com that are unappealing to the police department. Last yesr she was seen tearfully sulking because she had not received a gold detective badge for aLl her loyalty. What the hell makes her think she deserves a detective badge? 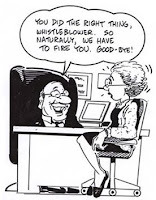 Keep up the good work Nicoile and maybe Captain Wayman will take you out to lunch on secretary's day lkater this year. As a training officer Jim Stivale trained her right up until he marrie her. Gives a whole new meaning to "undercovers" assignment. What do you expect from Nicole. She came to WPD from another department where she couldn't get past the entry level position. Then she comes to WPD and with her extensive experience in police work proceeds to be critical of seasoned officers who have more experience then she ever had or will have. But Davy saw fit to give her a cushy desk job with weekends off no accountability (able to get vactions whenever she wanted) and off all holidays. Not a bad gig plus salary and benefits. Wonder if she got hazardous duty pay for pushing that dangerous delete button afterall she could have broken a nail. Can you tell me why after John Morgan left his post there was no attempt to replace him. Instead Rowe was put in and left there at a higher rate of compensation to the town. Plus someone had to replace him at his post. Which cost the town even more. Det Sgt John Rowe is a member of the Wayman and Tracy TEAM, so he is untouchable.He had to be removed from his cushy job in the Detective Bureau because Rowe had MAJOR issues with minority members of the Bureau and was placed into another cushy position in parking, where he gets unlimited overtime. 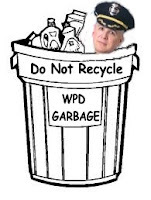 Of course no investigation was commenced on Rowe when the Detective filed a complaint against him for his problems in the Bureau just like when he STOLE TIME the Chief opted not to investigate that either .WELCOME TO THE TRACY CONSTRUCTED WPD, land of criminal misfits. Tracy was the most honest person to ever wear a badge. How dare you insult him. Just ask Jackie Hall, he will tell you and I believe Jackie Hall because he is the most honest citizen ever to walk the streets of Westfield. Hall and Tracy, Tracy and Hall perfect together. It appears the charade is coming to an end. The attorney General's office is overseeing the ongoing investigations into allegations of illegal and corrupt activities within the police department. As the old saying goesm be careful what you wish for. The Mayor gave everyone else advice to contact the higher authorities so they did. Hope you are implicated Mayor, along with Gildea and any other council member that allowed this to happen. John Rowe is probably one of the biggest idiots I have ever met. I am not alone in this belief. The Union County Prosecuters office has no use for him (or Davy) in fact John's nickname was One Way Rowe. If there was something going on and it didn't effect him John was no where to be found. There are others that can confirm Rowe is useless just ask Skip Garley from Woodbridge PD. Rowe screwed him too. Might as well throw Cliffy's name on the request for overtime. Since he would schedule IA interviews when HE is off. Amazing how the same names pop up when it comes to overtime abuse. Remember when they sucked dry the overtime budget for court instead of allowing patrolmen to take it at a lower rate and make it last longer. Mr. Bell called them Gold Badge Jobs. I really like that Wayman is so bold that he comes into headquarters in the middle of the night for 5 minutes, leaves and hooks up with one of his pathetic women and puts in for overtime.nice job if you can get it.